Old basement windows are a problem, both inside and outside the house. 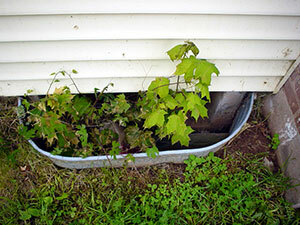 Do you have window wells that are full of debris and vegetation? Do you have basement windows with rusty steel frames that need stripping and painting? Is your basement chilly in winter because of all the heat loss through single-pane glass, and all the cold air leaking in around the window frame? You can permanently put an end to these basement window problems with innovative basement window upgrades from Basement Systems. Unlike “old-school” basement window products that will rust and deteriorate over time, our windows and window wells never require painting or maintenance, and they’re just about indestructible. 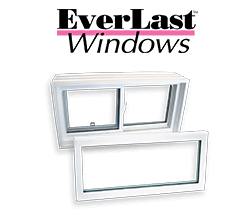 EverLast™ Window Inserts replace ugly basement windows with insulated glass in a maintenance-free vinyl frame. 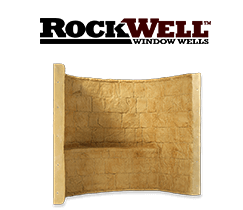 RockWell™ Egress Window Wells let in natural light and are large enough to use as an emergency exit. 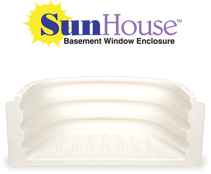 SunHouse™ Window Wells feature durable, all-vinyl construction and clear acrylic tops to keep out rain, debris &amp; pests. Why replace your basement windows? This window needs help. It’s easy to see how basement windows get a bad reputation. Basement window protection. With a basement window well and cover, you won't have to worry about debris. If you have old wood windows that are rotting or windows that leak or let in drafts, replacement windows can make a big difference in your home’s comfort, energy efficiency and curb appeal. Making sure your basement windows and window wells are in good shape is key to keeping moisture and water out of your basement. Windows and window wells that are rusted and corroded can allow leakage from rain and snow, which can cause mold, mildew and other problems. Leaves, dirt and other debris can also clog the window well, causing flooding in the basement. 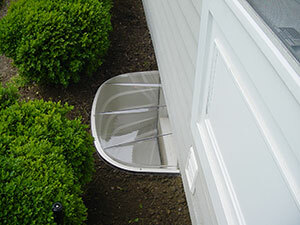 Replacing your windows and window wells can prevent basement water problems caused by leaky basement windows. if you’re considering finishing your basement or remodeling the space to include a sleeping area, you’ll need to add egress windows to create a safe exit in case of an emergency. Egress windows also add extra light in your basement, making it more inviting. If you're interested in upgrading your home with any of our basement window, window well or egress window products, contact us today to schedule a consultation and get a cost estimate.